The book 14 Hours has been authored by Ankur Chawla , who at present , holds the managerial position at the Taj mahal Hotel in Delhi. 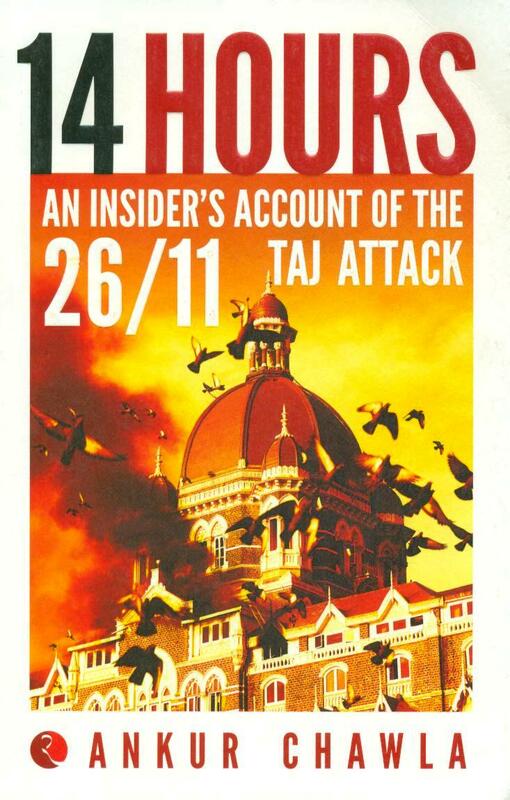 The book is an autobiographical account by the author, one of those fortunate survivors from the horrendous beseige by terrorists of the Taj Mahal Palace and Hotel , Mumbai that occured on 26th November 2008 , an incident which pinned the whole country in a state of utmost horror and disbelief . The author was serving the hotel as an operations management trainee at that point of time . The account flags off with a brief introduction of the author’s life prior to the incident . The apprehensions of the author who is blessed with an enviable opportunity to serve the Taj Hotel, Mumbai , given that he hails from Delhi , has been sketched perfectly in the earlier pages . Then ensues the incident proper , and the imaginations of the reader is dragged down to the subtle ingredients of the opulent hotel , which gained it the privilege of being the most sought after hospitality sector in India . The pace seemed to suffer a bit in the start , but it sure gains momentum after the first fifty pages and the pace gears up, taking the reader to an entirely heightened emotional level , which indeed brings to life a saga of horror , bloodshed and ultimate wreckage. The readers would definitely have their minds opening up in the realisation of the extent of disaster the incident actually was , both to the innocent people who lost their lives in the cold blooded massacre and to the hotel authorities equally . The author has penned down a powerful and poignant depiction of the egregious deed and the mental and physical turmoil he and his colleagues were forced to succumb to , on that doomsday . We come to know from the author that , amidst all those torturous whirlpool , he and his colleagues never for once deterred from their duty to keep the safety of the visitors on a higher platform . The part which i found the most engaging , albeit mind wrecking , was the narration of the grueling hours the author and his fellow mates had to tread in the linen room . If i , as a reader relishing the pages in the comfort of the four walls of my home could find the incident nerve stirring , one can very well imagine the intensity of emotions the author must have gone through enclosed in the darkness of that dingy hide out , counting seconds , deafened by the alarming shrillness of the gunshots . After having been mentally taken on a roller coaster ride of those eventful 14 hours , i found myself reading in relief and happiness , the portions where the author returned to his residence , his lighter moments with his room mates and the part he played in the renovation of the hotel . The one emotion which untiringly echoes throughout the pages, is the warmth of his relationship with his mother and the depth of this relevation, that his family mattered the most to him , which happened to dawn on him like never before during the period of hostage . One cant help but feel connected to that gurgle of emotion the most . The narration ends with a glimmer of hope and the author, being tagged as a survivor, is seen truly surviving the flashing shreds of the past in an admirable manner . The note to his mother towards the wrap up section is heart warming to the core . 1. A few typos at places , which can be overlooked. 2. The writing seemed less evocative in the beginning , though the author does a commendable effort in pulling it back to the frame halfway . 3 . Intriguing title and content . Recommended to : Those in search of influential autobiographical works and light reads would especially love this book . However, i recommend this book to all book worms out there . You wouldnt regret this one ! P.S : This review is a part of the Book Review Programme at www.blogadda.com Participate now to get free books! A nice review. I seldom see people who took pain to read and review a book through blog, You it, although appreciation will not help to compensate, Courtesy demands..All the very best.